Enter the name of your menu item, to be displayed on the top navigation menu. You can't change the title for the Cart, Login and Categories menu item types – but you can enter a title for your own purpose. This won't be shown on the navigation menu. Select which store(s) you wish to apply the new menu setting to . If you're running a multi store setup, use this setting to differentiate menu items for individual stores. Adjust the order of menu items. Menu items will be ordered according to the assigned number – eg. enter 1 for the item you want to appear first, 2 for the item you want to appear second, and so on. Choose which page you want to use for your menu item (only appears if the CMS Page menu item type is selected). A dropdown menu will be automatically populated with your store data. If you want this item to appear as a sub-item of an existing menu item, select the parent item here. Choose which category you want to use for your menu item (only appears if the Category menu item type is selected). A dropdown menu will be automatically populated with your store data. Choose which product you want to use for your menu item (only appears if the Product menu item type is selected). A select tool will be automatically populated with your store data. Choose which category you want to use for your menu item (only appears if the AW Blog Category menu item type is selected). A dropdown menu will be automatically populated with your blog categories. Choose which post you want to use for your menu item (only appears if the AW Blog Post menu item type is selected). 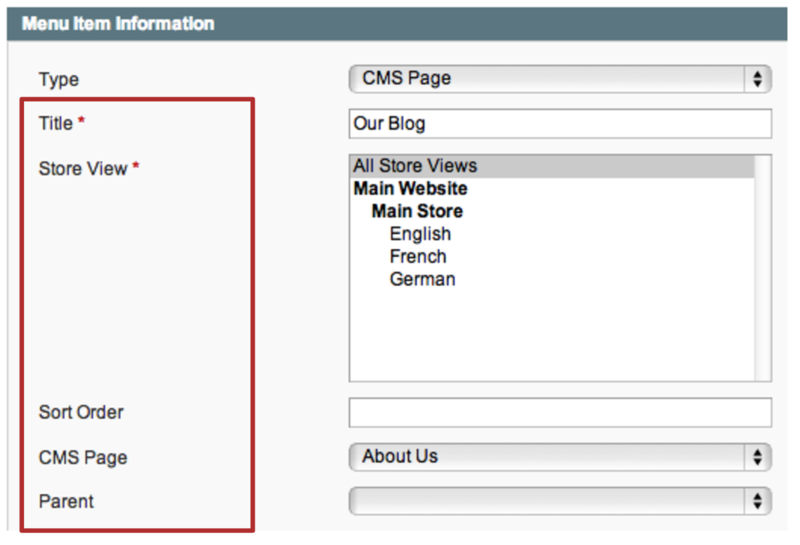 A dropdown menu will be automatically populated with your blog posts.